July 1, 2014, 10:30 AM · The viola, with its deep tone, its repertoire that tends toward the dark and contemporary, can be a source of truly inspirational music-making. 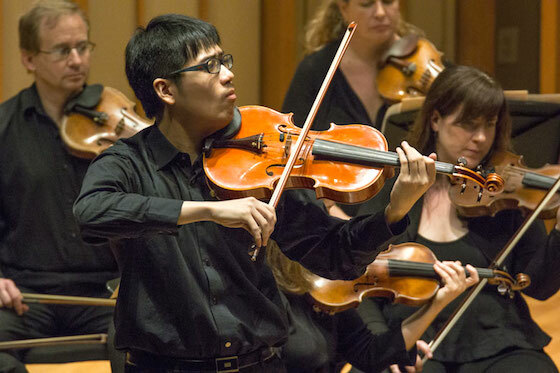 Certainly the young artists who performed in the Primrose International Viola Competition earlier this month showed the viola at its finest, and none more than the finalists and first-prize winner Zhanbo Zheng of China. Zhanbo played with unwaveringly good pitch, beautiful tone and control. His playing was marked by tremendous energy and thoughtful musicality. Zhanbo studies viola with Wang Shaowu at the secondary school division of the Central Conservatory of Music in Beijing. He speaks mostly Chinese but was kind enough to answer some questions by e-mail, to help us get to know this excellent young musician. Violist Zhanbo Zheng, 17, of China. Photo by Dwight Pounds. Laurie: How old are you, and how old were you when you started playing? Zhanbo: I am exactly 17. I started learning violin at the age of 5. Laurie: Did you start on the violin and switch to viola? If so, what made you want to switch to viola? Zhanbo Yes, I did, and actually I think viola is really melodious. The viola can show such a beautiful tone, between its high and low register. It also never has a sharpness to its tone. In fact, I passed the entrance examination for both violin and viola before I got into school, but I chose viola. The immediate cause of choosing the viola was that I had heard Teng Li’s playing once, when I was learning violin. After her concert I was totally touched, even a little shocked. I thought, how could this instrument make such various colors? It’s just a little bigger than the violin! Then, I switched to the viola. Laurie: How long do you practice every day? Zhanbo It’s less than 3 hours, because of normal classes, chamber music and orchestral. Laurie: Your playing is very musical. How do you keep it musical, while also working on a very high level of technique? Zhanbo It’s a complicated problem! The technique, certainly, requires time to practice, but if the music is just in your heart, you make the technique serve your music. My teacher told me that when you practice, you should think what the music should be, rather than what the technique should be. Laurie:What is your favorite music to play? Is there a piece you are really wanting to learn next? Zhanbo There are so many good pieces to play, I can’t find ‘my favorite.’ I really hope to play the Viola Sonata Op. 11/4 by Hindemith, that’s amazing! And I’ve also heard several new pieces in this competition, I’d like to try them. Laurie:What is your favorite thing to do, besides viola? Zhanbo Watching movies, reading books, running and badminton. In some ways, I can benefit from that for my music too. Laurie:In your opinion, what is the most important thing you have learned from your teacher? Zhanbo Prof. Wang Shaowu has taught me a lot, and not just about the music. His daily behaviors and his attitude towards parents have helped me understand how to have integrity and to be respectful to my parents. I believe that daily life has a great influence on one's musical life. And when it comes to music, never let off the problems, even if they’re really tiny, when you treat the music. Laurie:Do you have anything to add? Zhanbo I just want to express my appreciation for Prof. Wang, who guided me in music; my parents who loved and understood me always; my school which offered me a great platform; and everybody who has helped me. I could not have won PIVC without all of you! Thanks! July 2, 2014 at 01:54 PM · "Zhanbo It’s a complicated problem! The technique, certainly, requires time to practice, but if the music is just in your heart, you make the technique serve your music. My teacher told me that when you practice, you should think what the music should be, rather than what the technique should be. " Astute kid, look forward to hearing more of him as he develops his career. July 5, 2014 at 05:56 PM · Does anyone know if the Primrose Competition finals were ever webcast, or if there's a video online anywhere? I "tuned in" at the time the finals were supposed to be shown and got the message that due to union rules, the broadcast was delayed but never got more information than that. I saw Zheng's semifinal performance, he was great!